Dorfgastein’s Haus Mauberger is within a 5-minute walk of cross country ski trails, a ski bus stop, the Dorfgastein ski region, a swimming lake, bakery and restaurants. A supermarket and tennis courts can be reached on foot in 10 minutes, and Bad Hofgastein and the Bad Brückenau golf club are both within 9 km. The Mauberger apartment has free WiFi, a balcony with mountain views, a living room with a double sofa bed and a flat-screen TV with cable channels, a bedroom, a kitchen with a microwave, dishwasher, oven, coffee machine and dining area, and a bathroom with a shower and toilet. A bread delivery service is available in winter upon request and against a surcharge. The property has a garden with a trampoline, seating area and barbecue facilities. It also has a ski storage room with boot drying facilities, and parking is available on site free of charge. 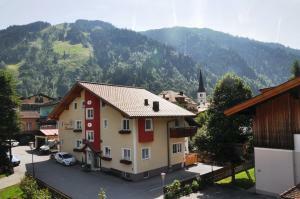 When would you like to stay at Haus Mauberger ? This apartment has a balcony with mountain views, a living room with a double sofa bed and a flat-screen TV with cable channels, a bedroom, a kitchen with a microwave, dishwasher, oven, coffee machine and dining area, and a bathroom with a shower and toilet. Please inform Haus Mauberger in advance of your expected arrival time. You can use the Special Requests box when booking, or contact the property directly with the contact details provided in your confirmation. A deposit via bank wire is required to secure your reservation. Haus Mauberger will contact you with instructions after booking. Each day we'll check prices and send you an email for your selected dates at Haus Mauberger. If you don't have specific dates but would like to check prices for say next weekend or say next month we can check the price too. Click to write a review and share your experience of Haus Mauberger with other travellers.